Mill magazine box mortise rearward as shown in (figure 1), just long enough for the extended box to fit. 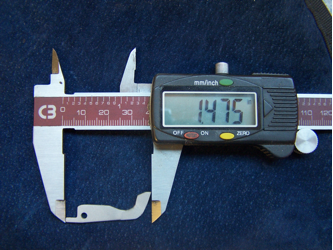 Shorten face of bolt stop .110” (figure 2) to accommodate extra box length. On Win. M-70 actions, the ejector and bolt stop will need to be modified as well. See (figures 4&5). Figure 1 – Altered Receiver on top. 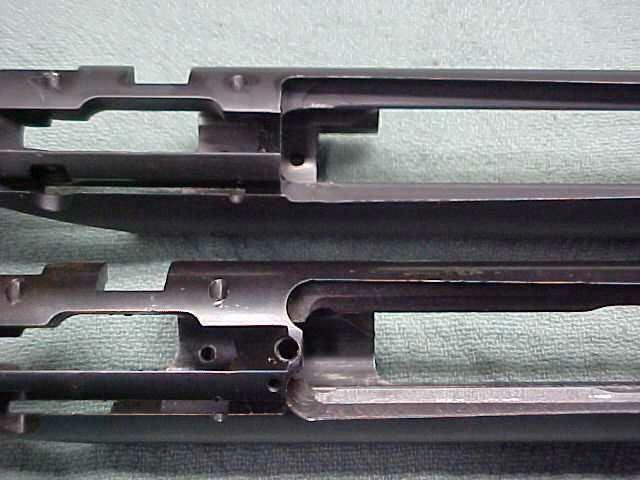 The top receiver body shows where the magazine well has been machined back and the feed rails opened at the rear as well. Disregard the clip slot cut in the top receiver. This was a M-721. The bottom receiver body is a factory M-700. The face of the bolt stop on top has been shortened to allow the bolt to get behind the rim of the cartridge. The bottom bolt stop is factory. If using the staggered feed extended box on the Rem. M-700 in the Ultra Mag. calibers, it may be necessary to remove the magazine lips on the box to expose more receiver rail. See (figure 3). Failure to do this may increase the chance of ratcheting of the cartridges from the box when operating the bolt quickly. On center feed models, it may be necessary to fit the magazine lips for the caliber used. When fitting the magazine lips, bend the lips in until it takes medium pressure (10-15 lbs.) to push the cartridge through them. When doing this, make sure that the magazine lips DO NOT contact the action rails. If allowed to do so, this will cause a bind during the loading process. If lips contact the rails during loading, shorten the lips and bend in slightly. The easiest way to alter the lips is to use a block of aluminum or hardwood approximately as wide as the inside of the box. Insert the block so the top of the block is even with the bottom of the cuts of the magazine lips. Catch in a vise and tap the lips inward. All of the bending should take place at the bottom of the cuts, not at the top of the lips. If you go too far, simply install the block between the lips at the top and easily close the vise to straighten the lips. To test the lip bend, install box in action, load two down and over ride with bolt. When bolt is opened rapidly, the top cartridge should come up parallel to chamber and be retained by the lips. Once I see that all is working correctly, I TIG weld or silver solder the back halves closed to keep the tension on the lips constant. This design is not of the in-line type. The cartridges will sit in the box staggered and will pop to center when pushed forward. 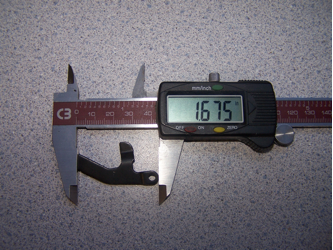 These are pictures of the Winchester ejector and bolt stop after modification. In the staggered feed design, an alteration may be made to the trigger guard assembly to allow the third round down. 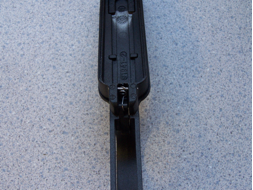 The normal cause of stoppage is the rear of the follower catching on the shelf created by using the extended magazine box. In the following sequence of pictures, I will demonstrate how to modify the trigger guard assembly to accommodate the third round down. The first step is to remove the floor plate latch, pin, and spring from the assembly. 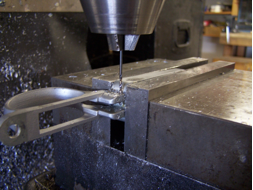 For the milling process, it will be easier if the floor plate is also removed. 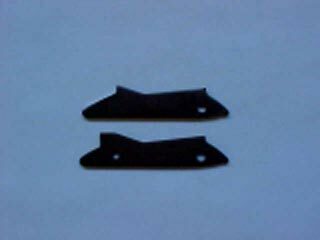 The pins for the floor plate and latch are enlarged and splined on one end, so they must be removed in the correct direction. 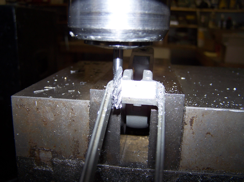 Place the trigger guard in the mill and mill an angular slope that forces the rear of the follower forward when it contacts this area. 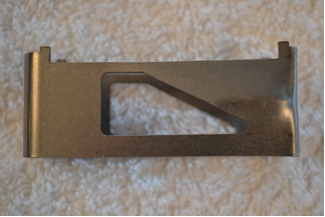 This slope will allow the follower to ride all the way into the bottom of the magazine well and allow the necessary space for the third cartridge. I know what you’re asking right about now. What happens to the latch spring since we’ve altered the guard? 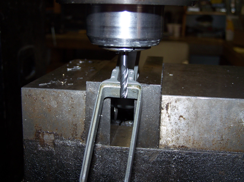 We’re going to drill a 1/16” hole, cross ways through the guard to which we’ll attach the last hoop of the latch spring. If performed correctly, this modification will add the third cartridge and allow the factory magazine capacity once again.